Organic Sales: Overall store sales are 50% organic. Produce sales are 100% organic or meet the criteria for organic practices. Durango Natural Foods has recently implemented a new No GMO policy, which includes requesting statements from manufacturers regarding GMO content. The store’s buyer, Brian Boody, works with local vendors to source non-GMO options. He also encourages all vendors to remove suspect ingredients from their products, and if they cannot substitute them immediately, to let the co-op know when the vendor will be able to substitute GMO for non-GMO ingredients. Brian has persuaded several suppliers to switch out GMO ingredients for non GMO alternatives. The co-op is removing products that may contain GMO ingredients as well as ingredients such as canola oil that may be GMO-free but not a product the store wants to continue selling. Durango Natural Foods Co-op is in the process of labeling all products containing GMOs and will not bring in any new unlabeled GMO products. The co-op’s non-GMO position will be formalized soon and added to the store's product policy. 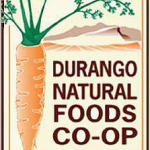 Durango Natural Foods Co-op is a Non-GMO Project Participating Retailer. Thank you soooo much for taking leadership in this important area.